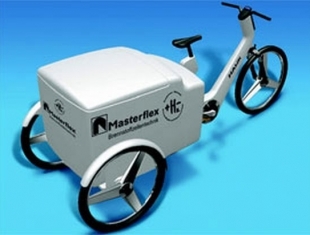 Deutsche Telekom is testing 14 fuel-cell powered Cargobikes in Berlin according to reports. This is the first commercial testing of bikes assisted by hydrogen powered fuel cell motors that could lead to large scale commercial use. Clean Air Bike is the result of a joint-venture between Masterflex and German bike maker Hawk. It is claimed the Cargobike can handle loads up to 550 pound and one fuel cell lasts for 155 Miles powered by only 90grams of hydrogen within a 2.2kg storage unit.